The BIOMEDevice trade show begins tomorrow Dec 3rd and runs thru Dec 4th. This event will be held at the San Jose Convention Center in San Jose, CA. Visit with Lucas and Zeeshan at booth 407 to learn more about the Reaction Injection Molding (aka RIM) process; and if it may be a viable solution for your “low volume” life science project. 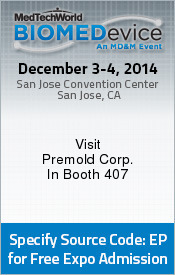 Premold Corp will be exhibiting at the MedTechWorld Event in San Jose, CA. Join us at booth 407.